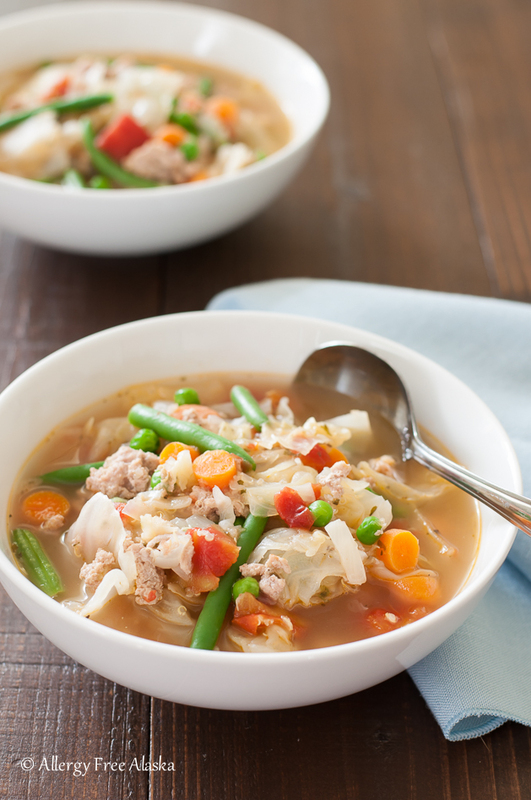 When I need a nourishing bowl of warm comfort food, this Ground Turkey and Garden Vegetable Soup with Quinoa recipe is what I make. With flavorful ground turkey, tangy tomatoes, fiber rich veggies, and protein packed quinoa, it’s a staple meal in our house. I make it at least 2-3 times a month, even my kiddos devour it. 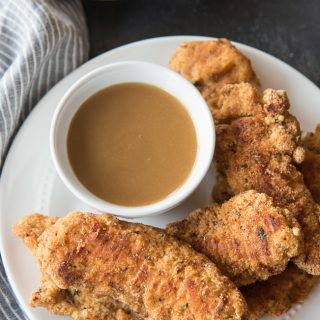 This recipe is adapted from a recipe my grandma used to make me as a child whenever I went back to Michigan to visit. I always looked forward to and requested gram’s famous “Diet Soup.”I don’t know if that was really what it was called, or if that’s just what my mom and I referred to it as. It was my comfort food from gram. I’ve been struggling to post this recipe, because of its emotional ties. I finally photographed the soup yesterday and decided I would post the recipe today. This morning I logged into Facebook and realized that gram passed away 2 years ago, to the day (thank you, Facebook memories). When I realized that, I was blow away by the timing – how everything fell into place on this day of all days. While I don’t necessarily believe in coincidences, I do believe that sometimes God gives us small gifts like this when we lose a loved one, just to remind us everything is okay. Today’s gift made me smile. Grandma loved me and she loved her family. I will forever remember her with curlers in her hair, painted nails, and screwdrivers before bedtime. I miss her. Gram’s version of this soup was a little different than mine. She used barley instead of quinoa, and she always added corn and a can of rinsed butter beans (which I haven’t been able to find here in our Alaskan grocery stores, but if you have them on hand, feel free to add them). That’s the beauty of this recipe, it’s really versatile. 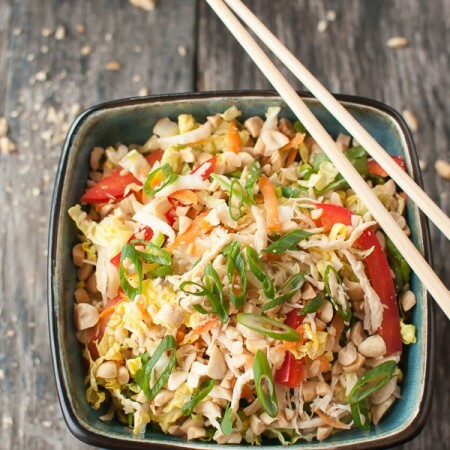 You can easily swap out the veggies for what’s in season, or with what you have an abundance of. Zucchini, fresh tomatoes instead of canned, corn (if you tolerate it), bell or sweet peppers, potatoes, etc. If you do make substitutions though, I don’t recommend omitting the cabbage. 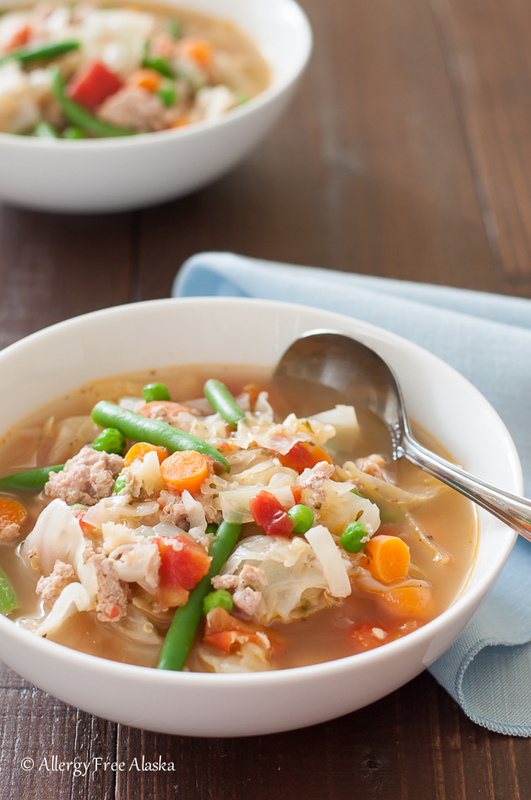 It adds a special richness to the broth and makes this soup extra special. Love, from my kitchen to yours. Heat the oil in an 8-quart stockpot over high heat. Add the ground turkey and cook, breaking it up with a spoon, until browned. Add the chopped sweet onion, peeled and chopped carrots, 1/2 cup uncooked quinoa, dried parsley, dried Italian seasoning, and garlic powder. Cook for 2-3 minutes, stirring occasionally. Add the canned diced tomatoes and chicken broth, and bring to a boil. Reduce heat and simmer, covered, for 15 minutes. Uncover, return heat to high, and add the peas, green beans, and cabbage. Bring to a boil, reduce heat to medium, and cook another 5 minutes. Thank you for sharing such a personal recipe, Megan! Thank you for the beautiful memories of your Grandma. I’m sorry for your loss, and am grateful you have good memories of your grandma. Sweet precious memories. Your remembrances brought to my remembrance of a similar soup my aunt used to make called autumn soup. I haven’t thought of it in a long time, and as you said it IS comfort food. I do have the ingredients for your Grandma’s recipe and today is going to be chilly for summer. 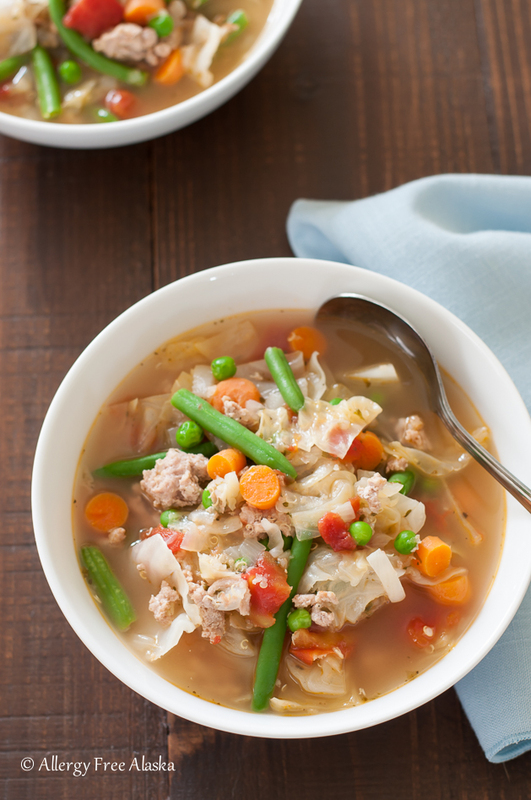 This soup would hit the spot and be warm and nourishing, and super easy. I love light and healthy soups for the summer! I need to make this soon! This post makes me miss my grandmothers, too. Not that my Bugga and Memother made soup like this… but the idea of cooking with them and spending that time together and sharing a dish near and dear to their hearts. Even after loved ones are gone, their memories live on. And I adore when those memories involve a dish I can make because making food makes me happy. Thank you for sharing your story and this recipe. I could go for a bowl of this soup now! 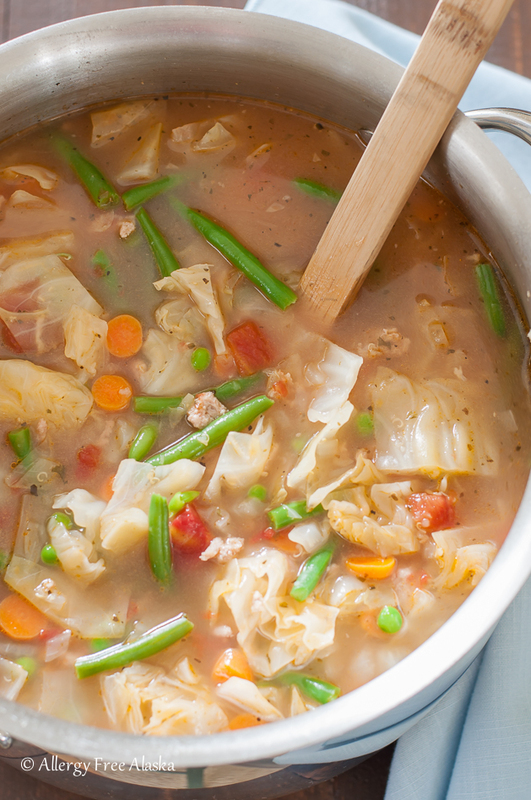 We’re definitely a soup family here…we eat it year round. I made a big pot of cabbage, chicken and kielbasa soup tonight. I’m looking forward to trying your recipe! Facebook memories are a bless and a curse aren’t they! However, I know you miss her but it’s wonderful to be reminded of some memories sometimes! <3 Love the soup! I will be saving this for when it starts getting cold! This is such a light, beautiful soup for summer. Just love it! 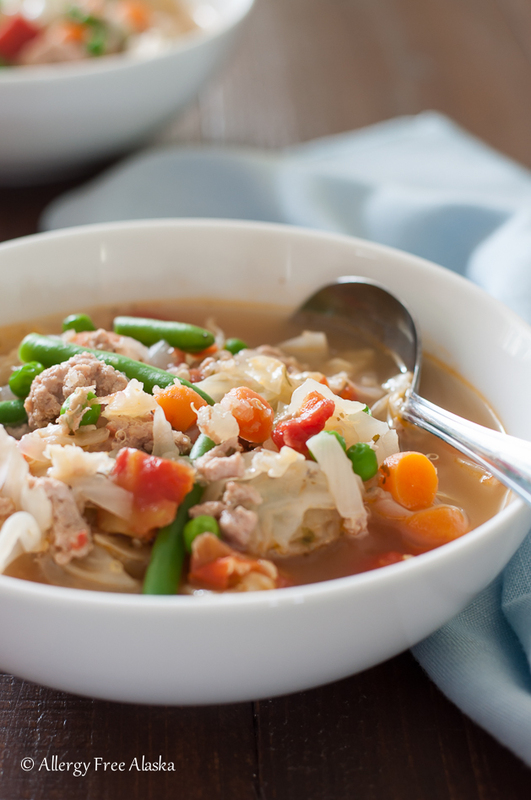 This soup is pure comfort! Love the combination of turkey and quinoa! I just found your recipe and it sounds so delicious that I, am excited to try it. I love Turkey and Qunioa so much eat it alot and on so much of my meals. We eat soups all year long and haven’t been on my Gluten Free Diet, but about 4 months so I’m always looking for new recipes. Thanx you so much. Is it really 14 cups of broth? Yes, this makes a big pot of soup. If you don’t want such a big batch, try halving the recipe. O.M.G.!!!!! this is hands down the best soup I have had. Thank you for sharing! My daughter is allergic to quinoa. 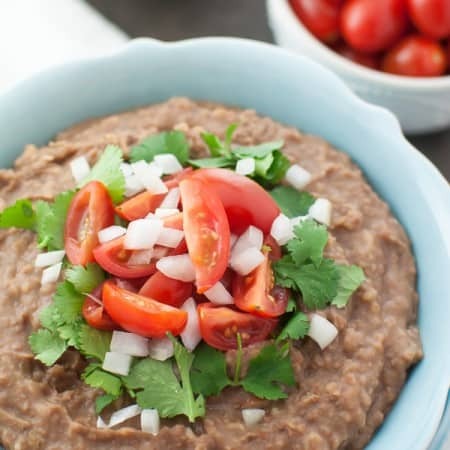 Would barley or rice be treated similarly in the recipe? 1/2 a cup added I’m thinking when the broth is added and perhaps simmer longer? I’ve never been a fan of my soups with rice, I must do something incorrectly! I just made a huge amount of chicken broth so this soup will be perfect for these rainy Alaskan nights! Thank you! Yes, barley would be treated similarly in the recipe (add it at the same time you would the quinoa). It’s been so long since I’ve cooked barley though (it contains gluten, which I can’t have), if memory serves me correctly, the barley may take an additional 5-10 mins of cooking. 😉 If you go the rice route, try cooking it separately from the soup. Add it to individual bowls, then spoon the soup/broth on top. It doesn’t get mushy that way!